If you believe you are dealing with someone in distress, we have resources that can assist you. Visit the Faculty and/or Staff resource pages for more information. York University is committed to a mentally healthy campus. York University’s Mental Health Steering committee oversees an initiative that aims to promote a healthy, inclusive and supportive environment that fosters mental health and well-being among members of the York community. The initiative was developed on the premise that wellness is a necessary pre-condition to learning and working, and that physical, emotional, intellectual, social, spiritual, mental, and cultural and environmental health and learning are interdependent. 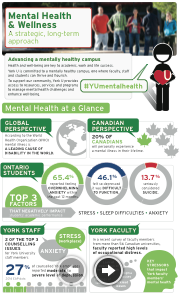 Through a variety of education, training and awareness events, York University’s Mental Health and Wellness committee strives to promote a more holistic, and integrated approach to campus health that supports academic excellence, employee satisfaction and productivity, as well as the overall success of all York community members. To learn more about how we are delivering on our Mental Health strategy, please read the 2017-2018 Annual Report for the Mental Health Strategy. We would like to take this opportunity to acknowledge the community's involvement in helping to identify areas of priority to focus on, and to thank them for their active participation in making York a mentally healthy campus.